When I was watching this week’s episode of The Walking Dead, I started thinking about how living during apocalyptic conditions would affect my parenting. How would I find the balance between teaching survival strategies and instilling character and morals? Then I sat down to write this piece, about parenthood and The Walking Dead. But then I realized… I already wrote that! Have I been blogging long enough that I’m beginning to repeat topics without even realizing it? I see my life — as the parent of a 1.5 year old — in The Walking Dead characters’ quest for survival. The show tells the story of a small band of survivors after modern society has been destroyed by a zombie outbreak. What the show is really about — its theme — is about maintaining your humanity and spirit in the face of hardship and a complete disruption of your old world. To me, this sounds a lot like new parenthood, those first months and years when a strange being — dependent on you to survive and thrive — dominates your daily life and disrupts everything about your previous existence. 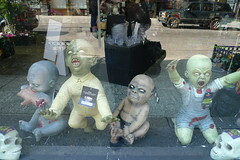 What are the ways that living with a new child is similar to surviving the zombie apocalypse? 1. You will be in denial until you actually experience it yourself. 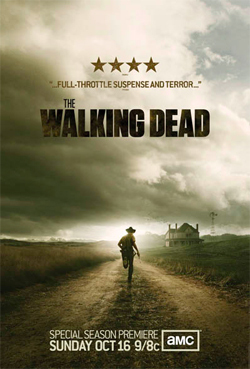 When Rick, the show’s primary hero and a sheriff’s deputy, wakes up after being in a coma in a hospital with the world overrun by zombies, he is told by other survivors how society has crumbled since he has been unconscious and about the nature and origins of the walkers. Until he gained sufficient real world experience, Rick couldn’t truly accept how the world has changed. Similarly, new parents are often told by experienced parents that after a baby is born, their lives will be irrevocably altered. They are told that they won’t sleep again, that their marriage will change and that they’ll bicker constantly with their spouse, and that they will love their baby more than they could think was humanly possible. But until you experience parenthood’s stressors and joys for yourself, you won’t truly be able to understand it. And somewhere in the back of your mind, when that child is still a hypothetical, you might think that your baby and your experience will be different. But it won’t. It will be the hardest — and best — thing you’ll ever do. 2. You will need to learn the ways of irrational and primitive creatures. Yes, there is nothing that is cuter, smells more heavenly, and causes your heart to swell like a new baby. However, their needs are fundamentally primal and primitive. They eat, sleep, poop, and cry. You will struggle to understand their language of cries and wailing. Just as Rick and his group of survivors learn more about the zombies — how they were created, how they are killed, how they reproduce, and their habits — in order to survive, new parents similarly must get to know their babies’ and toddlers’ patterns, temperaments, and needs. 3. You will need to team up. The gang on The Walking Dead make it through the impossible through collaborating and balancing each other’s strengths and weaknesses. Their survival is most threatened when they turn on each other, such as when Shane — because of his love for Lori and resentment of his former best friend and husband — is almost successful at dividing the group. The survivors’ personalities often clash, but they come together to work for the group. Similarly, the anxiety and exhaustion of new parenthood will try even the best marriage. You will fight about nearly anything, especially at 2 a.m. after the sixth wake up of the night and it’s been many weeks since you got more than a few hours of rest at a time. But learn a lesson from the survivors on The Walking Dead; you need to figure out how to work best as a team and capitalize on each partner’s assets. Just as one of The Walking Dead survivors might be skillful at fighting zombies with a bow and arrow, one parent might be a talented swaddler or bather. And you also must accept assistance from outside your “band” of survivors. Individuals or even couples stand little chance of survival during a zombie apocalypse alone. At some point, you’re going to need help from another group. For instance, Lori’s baby is saved when a stranger retrieves the infant formula left by Maggie and Glenn are kidnapped. New parents must also enlist outside help. Get relatives, friends, and neighbors to cook, clean, and do errands for you. 4. You will need to strip down your optional commitments. You don’t see anyone on The Walking Dead worrying about getting back in shape for swimsuit season, planning for a luncheon, going to yoga class, or updating their Facebook pages. I think even Maria Kang would be okay with the survivors’ “excuse” for not working out. (There is a character, the Governor, who did have a side hobby involving aquariums , but anyone who watches the show can tell you how that turned out.) Strip your life to the basics, at least for a little while. Don’t worry about anything besides what’s right there in front of you, which will be primarily a screaming baby. 5. Appearances shouldn’t matter at this point. Every character on the show is dirty, wears ripped clothes, and sweats profusely. They put on whatever they can find and what will help them survive. Likewise, new parents get permission to wear whatever feels good and what will help them get through the day. That stained sweatshirt that you don’t want to take off because it’s so comfortable, but don’t ever wear in public? Sure, keep it on for five days straight. Don’t want to blow out your hair or even brush it? That’s okay too. There may be puke in it soon anyway. A shower, however, could do work miracles for your mental state, as the survivors on The Walking Dead discover when they clean up at the CDC headquarters. There is good news: Your survival prospects — and a return to your earlier life — are much better than the characters’ prospects on The Walking Dead. The bad news? The new parenthood virus often returns: many people do go on to have a second baby. How would you describe new parenthood? Any other analogies that you can think of? I love this ~ and I’ve never even seen the show. But so so so true…. Sarah @ LeftBrainBuddha recently posted…The A to Z Book Survey! And I thought you might really enjoy this short film- if you haven’t seen it before. GREAT zombie/parenting bit! AAAH! I forgot the link! Oh, wow. That was incredible! Thank you so much for posting that! This is awesome, Jessica! Thank you for reassuring me that wearing the same stained sweatshirt five days in a row is not only normal, but perhaps even a good idea. And cheers to finding help in a team! This is so great! And so true. This is where the term “Mombie” comes from, Mom Zombie! p.s. I laughed (weird response maybe) to “side hobby involving aquariums” hahaha. Great post. Sharing! I know. Isn’t that the creepiest picture? I almost didn’t use it, but I decided it was more funny than legitimately frightening. I love this comparison! I’ve survived, and am now on the other side of this with older kids, which is why I can laugh at these truths so easily. Still trying to survive! Never seen it, but now I don’t have to. Apparently, I’m living it! Rachel, if you see it, start from the beginning. And please tell me when you start watching! Usually I do not learn post on blogs, buut I would like to say that this write-up very forced me to chck out and do it! Your writing stytle has been surprised me.